The article raises the question of evaluation criteria of contact-fatigue failure of machine parts. In addition to the traditional criteria – contact strength and contact fatigue, to include additional parameters, it is proposed to introduce additional parameters: contact resistance chipping ΔI, the relative area of chipping ΔS, the relative number of chipping Δn, the maximum relative chipping area ΔSmax, minimum relative chipping area ΔSmin. The input parameters allow better display picture wearing the action of cyclic loads of contact, to assess durability of the samples after hardening, compare the size and number of chipping on hardened and not reinforced surface. The proposed indicators can be calculated as in manual mode, using, for example, a digital image chipping and Compass program, and in the semi-based application on the basis of computer programs for metallographic analysis. Keywords: contact resistance, contact fatigue, chipping resistance contact, testing, chipping, fracture. Kirichek A.V., Soloviev D.L., Barinov S.V., Silantyev S.A. Increased contact fatigue machine parts heterogeneous strain hardened static and pulse processing // Strengthening technology and coatings, 2008, № 7(43). – P. 9-15. Solovyov D.L., Kirichek A.V., Barinov S.V. Increased durability of machine parts creating heterogeneous case hardened structure // Heavy Engineering, 2010, № 7. – P. 4-7. Kirichek A.V., Soloviev D.L., Barinov S.V., Tarasov D.E. Experimental setup for investigation of contact-fatigue wear of machine parts // News OrelGTU. Series «Fundamental and applied problems of Engineering and Technology», 2009, № 3-2/275 (561). – P. 7-13. Barinov S.V., Silantyev S.A., Solovyov D.L., Medvedev M.N. 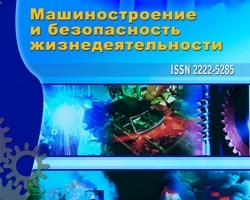 Equipment for research material to resist chipping contact // Engineering industry and life safety, 2010, № 7. – P. 87-88.